The broker co-op is the new home version of a buyers agent’s commission. Agent gets a broker co-op for a new home transaction from the builder as commission. 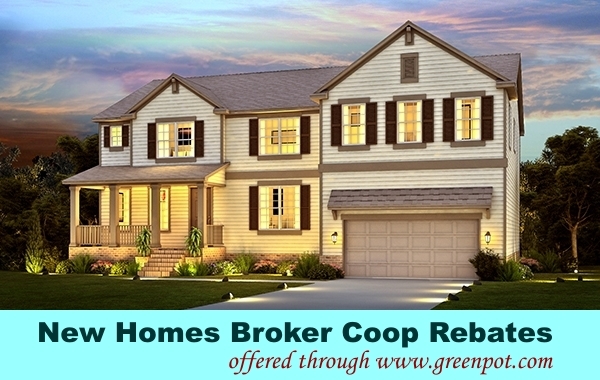 We will rebate part of our broker co-op commission back to the buyer after close of escrow. For you to be qualified to receive the $$$ rebate. Our agent must accompany you on the first visit to builder site. Today, more than 90% of potential home buyers begin their search online. With all the online tools available today to find homes, it’s easier than ever to conduct home searches on your own. If you’re a home buyer who’s willing to conduct your own searches online, we feel that you should be rewarded for the work and time invested in locating your own home. Therefore, we would give you a generous rebate by sharing a portion of our commission with you. Home buyer can use the extra cash on furniture purchase, home remodeling etc. New Home Broker co-op rebates offered through realtor. For new home buyer to be qualified to receive the cash rebate. Call or text greenpot agent at 951-888-0598 to assist you.